I find it a little hard to believe that it's already been 17 years since Hideo Nakata's "The Ring" was released to Japanese theaters. An instant sensation, word of mouth about the movie spread through online horror communities like wildfire and I was lucky enough to be able to see it very early on in the craze because my good friends at Atlanta's Videodrome had a Malaysian VCD before any official subtitled DVDs were available. This was shortly before I had become a toy collector and movies were my drug of choice at the time. In fact, besides visiting a friend, my first ever trip to Japan was spent mostly hunting obscure movies, not toys. (However, I did start buying toys shortly afterwards and in fact I was at Videodrome so often that I actually started having my toys delivered there!) As happens so often, some of the iconic imagery that The Ring presented has been done to death over the years and been spoofed to the point that it no longer is effective, but at the time, it was still new and to this viewer actually quite frightening. The Ring scared the crap out of me. I remember hearing at the time rumors of a Sadako doll being sold in Japan but those turned out to be false. But now we have at least two. The first is a soft vinyl figure by Marmit while the second is this S.H. Figuarts toy by Bandai, which comes us courtesy of Angolz.com. Sadako comes packaged in a compact box with a clear window and the figure rests in a plastic tray, alongside all of it's various accessories. The figure stands about 5.5" tall and includes many points of articulation. The neck, wrists, waist, hips and torso are ball joints while most of the others are one more traditional hinges. Both the elbows and knees are double jointed. However, for the knees, this really doesn't come into play very much due to the fact that she wears a long dress. You won't be doing particularly dynamic poses with this figure. One of the things that typically frustrates me about these types of figures is that articulation is great it can be difficult to get the figure into a more relaxed pose. However, in the case of Sadako, I don't really mind that because of the herky-jerky way she moved in the movie. She never looks quite normal. That's part of what makes her so frightening. Even if she wasn't wearing a dress, crotch thrusting wouldn't be an issue with this figure and in fact, she tends to do that opposite and lean forward, giving her a near hunchbacked appearance. Again, this only adds to her ghostly appearance. 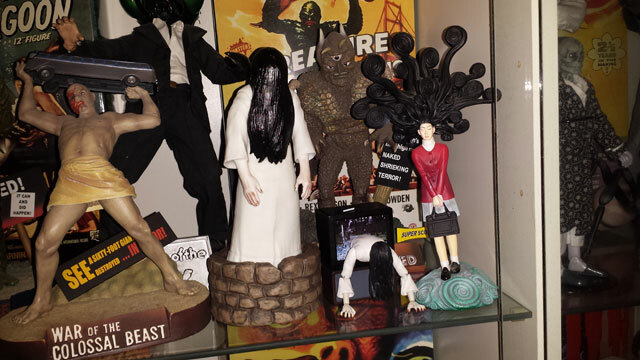 Sadako has two swappable hair pieces to cover the front of her face. The default one has a slight opening so you can see her creepy left eye. The other is nothing but hair. For accessories, a TV with an image of the video shown above is included, along with the tape it is recorded on. Of course, this is a bit of a conundrum because the video is not in the VCR, but let's not nitpick. You can remove this image from the TV and replace it with one that has a small peg in it. Then you can attach the upper part of the figure to it so that it appears that Sadako is coming out of the screen! At this point, you can completely remove her head and replace it with one that has her hair hanging straight down at the correct angle. Once she reaches the floor, another head with hair that spreads out on the surface is included. You can also replace the hands with ones that depict her scratching along the floor. A second two-part dress is included to accommodate the bent legs. After that, well..it's too late for you! I'm usually not too excited about these kinds of figures but this one is really right up my alley. It's a character I love and depicts one of the more frightening scenes in modern horror history. Since I also have the Marmit figure and that is in an upright position, I display this one with her emerging from the screen. Look for Sadako and other SH Figuarts figures at Angolz.com. I remember going to watch this in High School, and then stopped watching VHS.